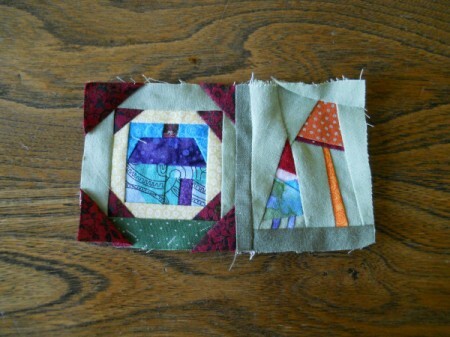 I love to make paper pieced projects. 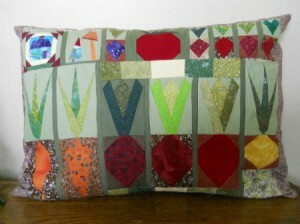 I took a brief break from a quilt to make this pillow cover for the DH's birthday. 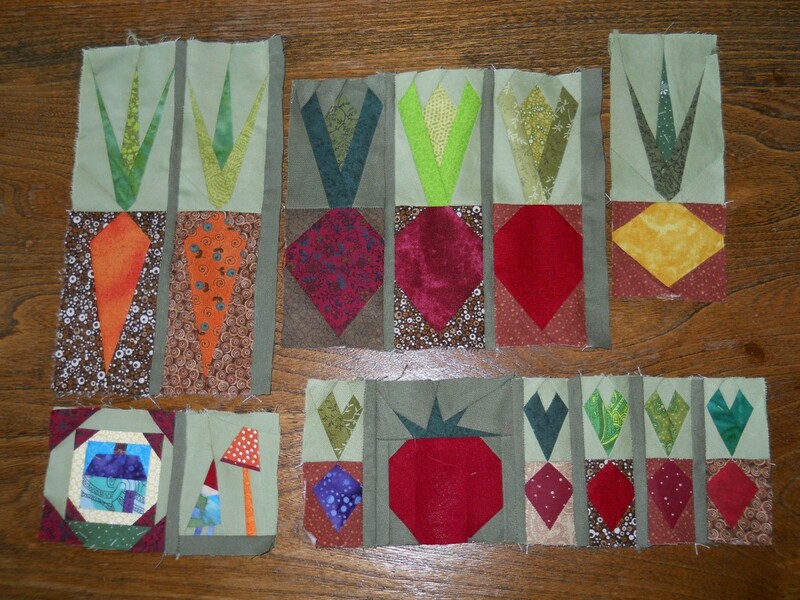 I had made my carrot book page weight and that inspired me to look for some veggie blocks. Total Time: Several hours while watching TV. I decided on the blocks that I wanted to use and completed as many of each type to cover the area needed for the pillow cover. I had to add filler blocks and a border to adjust for the necessary finished size. 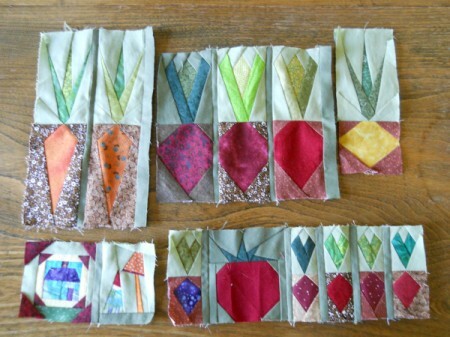 Make your blocks using paper piecing techniques. Instructions for Paper Pieced Quilt Block I used blocks from a book I owned and one found on the net. See footer for sources. 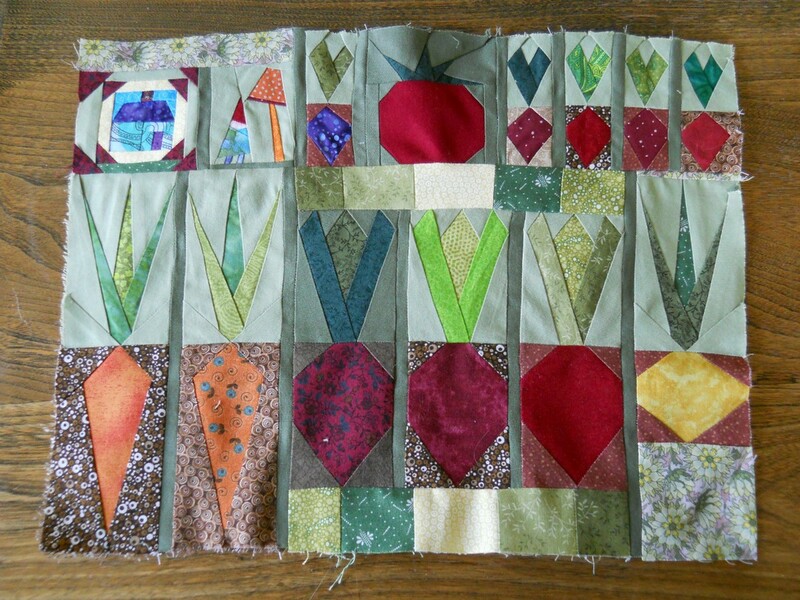 Once the blocks were sewn I then played around with the layout until I found one that I liked. In the final cover I moved the house and gnome blocks to the upper left hand corner; them seemed to be better suited to that location for the final overall effect. Once the blocks were completed I did measurements to determine the width of the sashing in between the individual blocks. 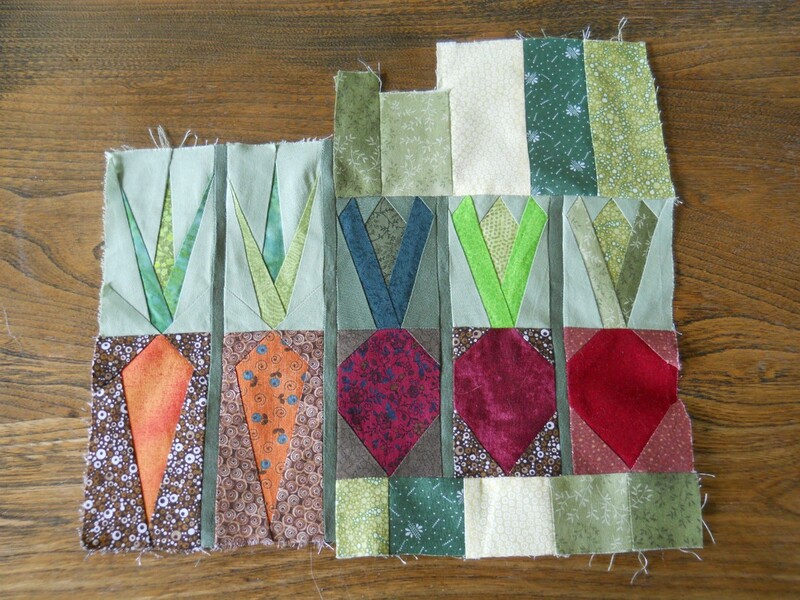 Some of it was done with a single color and other areas were filled with strips made by sewing several pieces of fabric together to get somewhat of a garden row effect. I also added some flowery fabric to simulate a flower patch in the garden. I sewed all of the pieces together continuing to check my measurements. As to be expected, for me at least, there was also some ripping and resewing when I didn't like how things looked. Once all of the individual blocks were sewn together, I measured the large block and cut a border to finish the project's top. I chose a floral brown for a bit of a path look. Next I measured and cut the fabric for the back of the pillow cover, to create an envelope style opening. 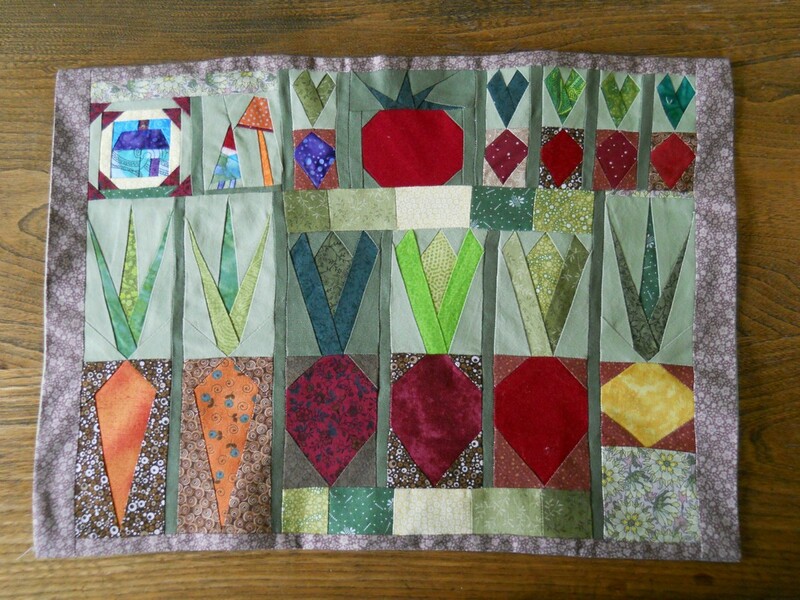 Veggie and house blocks are from: Paper Piecing Picnic - Fun Filled Projects for Every Quilter, from the editors and contributors of Quilter's Newsletter Magazine and Quiltmaker Magazine, copywrite 2001 Primedia Special Interest Publications. These particular blocks were designed by Theresa Elsinger. The gnome block is from a website: http://artisania.wordpress.com. The design is by Sonja Callaghan and is free on the site, for personal use. I admire your ability to do this kind of beautiful quilt!